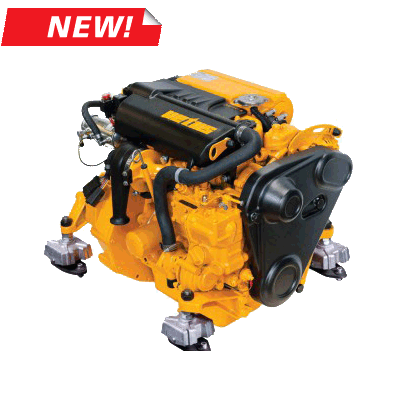 The new Vetus Mitsubishi M3.29 is a superbly quiet, compact and reliable 3 cylinder marine diesel inboard engine. The model shown here is the inter-cooled version with pre-fitted Twindisc TMC40 gearbox with a 2:1 ratio - ideal for small sailboats. Simple to install - and easy to maintain, with all service items grouped on one side. The M3.29 ships with an attractive, waterproof key-switch panel (2m extendable hard-wired loom) with warning lights for low oil pressure, high water and exhaust temperature. We can supply a package of perfectly matched ancillaries, all the way from the engine to the propeller, ensuring a trouble free installation and a long service life. New Air Filter housing reduces engine noise dramatically making the M2.18 one of the quietest in its class! We can offer a UK South Coast installation service - or help with any stage of the installation should you decide to install yourself. Providing the final installation is inspected by ourselves, or a Vetus engine dealer - the 5 year warranty is valid. Please contact us for further information.